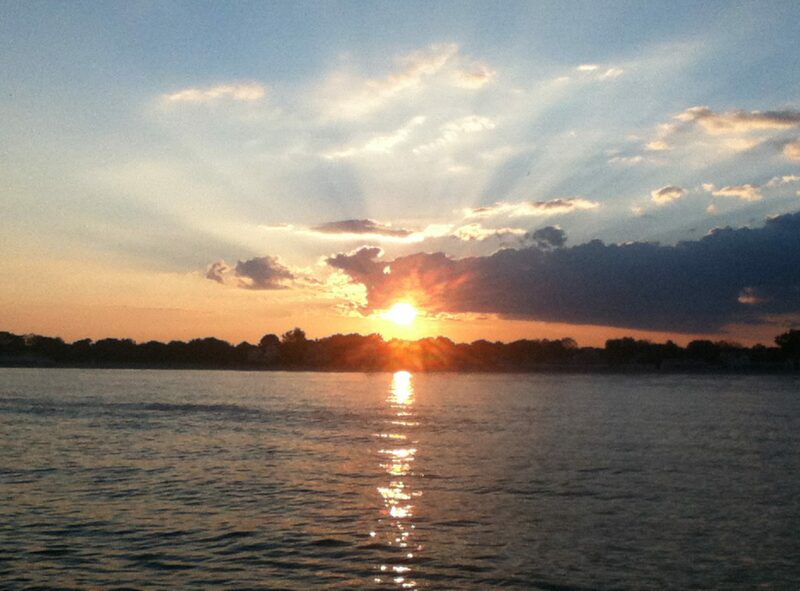 In light our annual Fairfield, CT Earth Day Celebration, I have updated this post I wrote. As you may remember from an my first post on frugal kitchen investments, I mentioned that I received $40 of Kohls’ Cash for buying a bread machine last year. At that same time “The Ninja Master Prep Professional Triple Play” was on sale for $45. It was and still is rated as a Consumer Reports Best Buy. 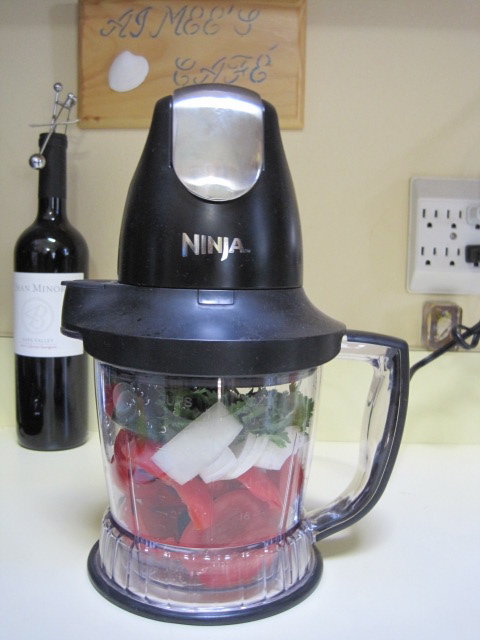 Combining the Kohls Cash and 30% off coupon, I got the Ninja Master Blender Set for $4.00. Couponing rocks!! 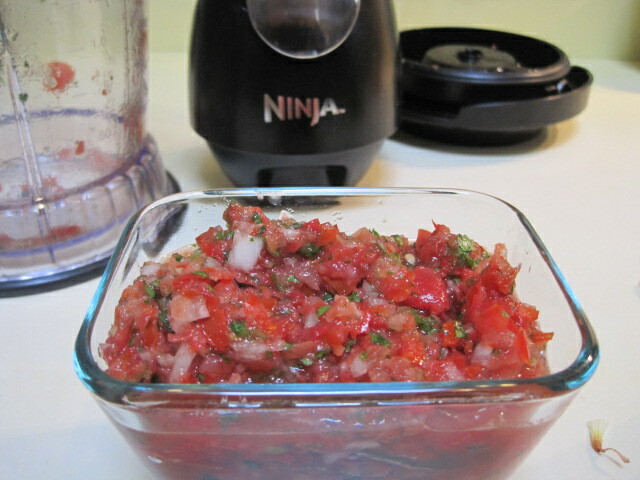 With this new blender, Pico de Gallo is even easier to make. I highly recommend it. 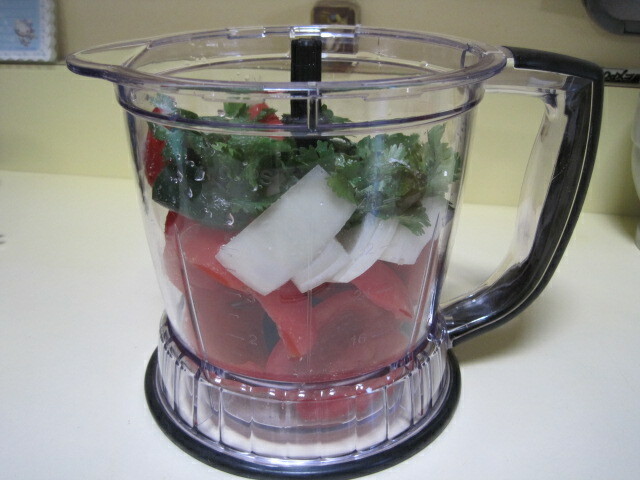 Enjoy this recipe, with or without the blender! 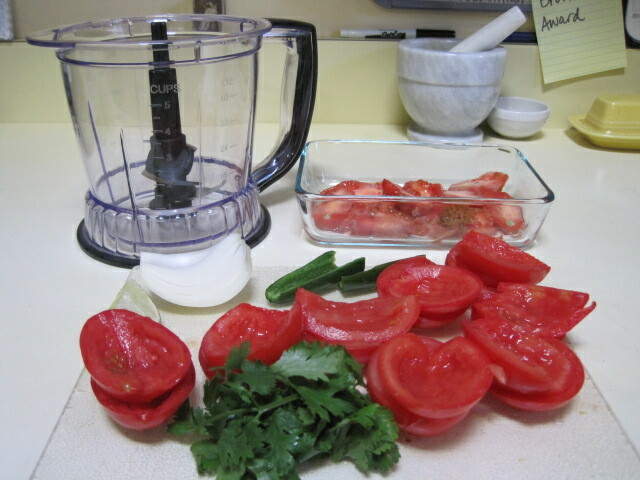 Pico de Gallo in a less than 15 minutes! We are a family of five, including three growing children. Our ranch style house is 1,100 square feet, with a 600 sq. ft. finished basement that has a full bathroom (thank goodness!). We have been a one-modest-income family for nearly nine years. We live debt-free in one of the most expensive counties in the United States. Little did I realize that it all began with cutting down on waste – literally, garbage. The first expense we cut was our garbage service. (If you are reading this from out of town, you read that correctly. Garbage service is not covered by city tax.) At that time, we had two in diapers and a town dump run four times a month. So for the first couple of years, it was only a savings of about $100 per year. However, a couple of years later, after our third child was born, we did two things that affected our garbage disposal: established a compost bin and discovered Freecycle. With a compost bin and worms from the backyard, our vegetable scraps turned to soil. Composting eventually led to the start of a modest 4’ x 8’ ft. raised bed garden, which in two years lowered our food bill and raised our health quotient. Freecycling decreased our need to purchase items. I’ve gotten great toys and games, arts and crafts, winter boots and clothing –in great condition- for our family. Conversely, by offering items Freecycle, I began the long, on-going process of de-cluttering our house. With composting and Freecycling, our trips to the dump and our spending began to decrease even more. Bonus: the environment benefited, too. Other ways we began to cut down on waste and spending: for the last five years, since my daughter started 1st grade, we have been using cloth napkins, and much to my husband’s dismay, stopped using paper towels. Instead, we reuse rags, wash with cold water and hang clothes on outdoor- and/or indoor- laundry lines. Also, for the last eight years, we have belonged to an organic and natural food buying club and buy food items such as the “dirty dozen” organic produce, grains, flour, sugar, and dried herbs, and non-food items, such as detergent in bulk at much lower prices than stores such as Mrs. Green’s, Whole Foods, and even Trader Joe’s. Today, with composting, single-stream recycling (as of last summer – #1 – 7 plastics and paperboard boxes (cereal and tissue boxes) can now be recycled), and just buying less, we go to the town dump once every three weeks! Several months ago, an online news video story about the “Zero Waste Home” caught my eye. Bea and Scott Johnson and their two growing boys downsized from a 3,000 square foot home to a 1,400 square foot home. They went from filling two large rolling garbage cans per week to holding four months worth of garbage in two hands. Living in Fairfield, CT, in Fairfield County, one of the most expensive and affluent counties in the United States, is being surrounded by a majority who believe that success is defined by having the most square footage, the most luxurious cars, and the latest “stuff”. I challenge you, dear reader, especially Fairfielders, to help turn this definition around. Let’s teach our children that success is defined by the ability to put people before things, and to refuse, reduce, reuse, and recycle. Less IS more. Health IS wealth. Click here for The Zero Waste Home video news story I stumbled upon. 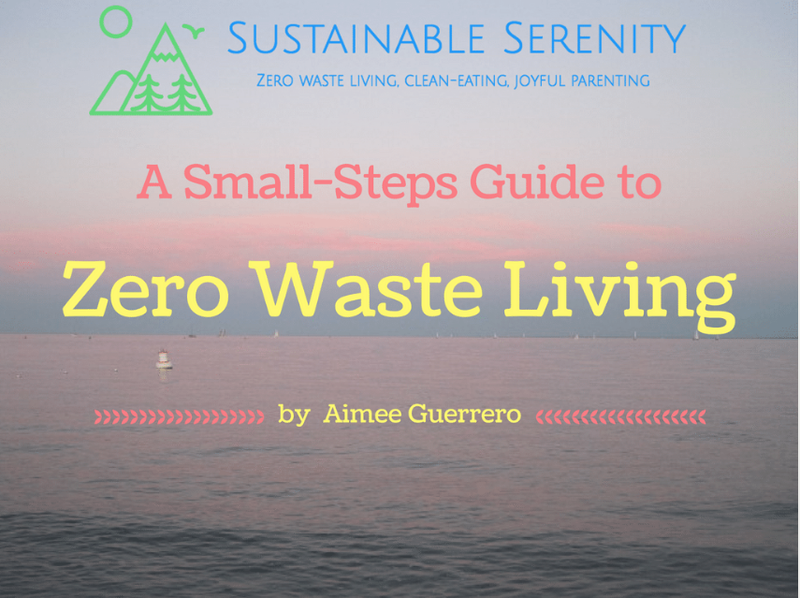 Here’s The Zero Waste Home Blog that inspires me. The “Dirty Dozen” Organic Produce list helps make eating organic fruits and veggies affordable. Download the app or print the wallet-sized shopping guide here. 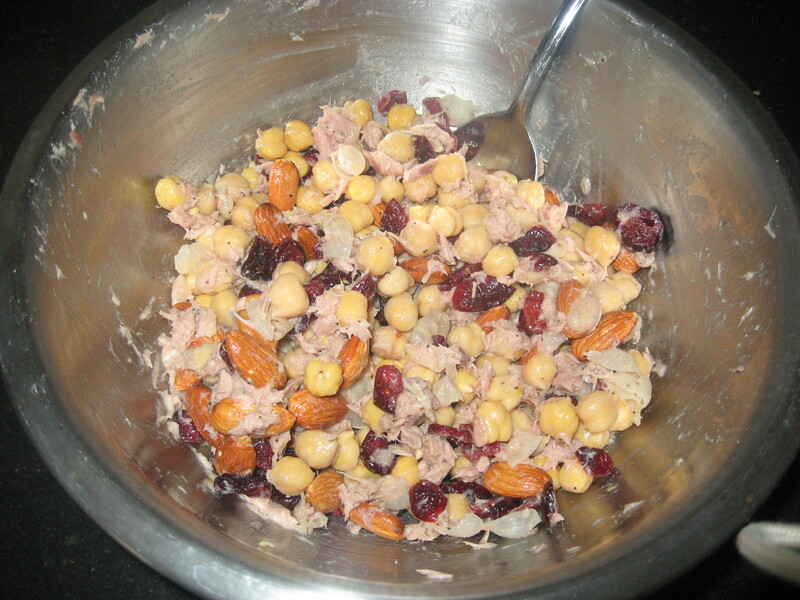 One of many resources on cooking and eating on a budget here AND here for budget food ideas. Our organic and natural food buying club is open to new members. Send me your email address to learn more.